An idea to shape what could become the most successful squad in HaloTracks history. Season 7 was the culmination of all our successes, and a chance for us to see just how far this squad could be pushed. Teams became an important addition to Season 6, but there was something missing. If we (Purple and Jeff) were to allow the top team to have a point bonus, then we needed to devise a system that would level the playing field. This came in the form of a draft governed by a salary cap. This was an idea that could either make or break HT Supercross. But we were lucky, and the prospect of having a draft was met with positive reception. Thus, Season 7 began. I won’t go into the races. That’s what the race recaps are for, but I will say this: Season 7 gave rise to what could possibly be the fiercest battle that this squad has ever seen. Defending champion, Sodapop Remix, would need to defend his title from the likes of l Panny l and Gogetarulez. A freak turn of events gave Sodapop the opportunity to create another mind-blowingly powerful team. A decision that greatly helped him at the end of the season. Though, this did not deter Panny from challenging this would-be Goliath. Enter PPL Park SX, and Panny had just one more shot at running for a championship. But things happen fast in HT Supercross. In the blink of an eye, Panny was sent off of the berm before rhythm 1, and that wreck soon paved the way for Sodapop to take his 2nd consecutive HT Supercross title. Throughout Season 7’s entirety, our leaderboards were awash with battles outside of 1st place. After all, the top two racers of the squad also were the leaders of the top two teams. Their skill and knowledge was to be passed down to their constituents, and would give rise to the start of something new. Racers like TheOffice1808, King Edward I, and Shazzle4, all now have the speed to win a race. And though only 4 racers were able to win races in Season 7, there’s no telling what our next season has to offer. We knew it would be hard to top Season 6. Hell, we didn’t even think it was possible. There’s no beating around the bush, Halo 4 is still in decline. Numbers just weren’t on our side, but we poured our heart and souls into this season to do everything we could to make it everything that it could be. Everything that it should be. Without a doubt, Season 7 is our most successful season to date. We averaged a whopping 18 signups all season long. This is something that has never been accomplished on HaloTracks before in a season as long as ours. More astounding than that, is the race that yielded the most signups was halfway through the season! We wondered how successful Season 7 could be. The answers to our doubts completely blew away our expectations and the profound success of Season 7 is something that we’ll carry into our next season. A deep rooted thanks to everyone who participated in this season. This squad is nothing without our members, and it’s an honor to be able to lead something that people look forward to being a part of. We’ve learned a lot about our success, and also a lot about aspects of the squad that still need improving. Season 7 is now over, but HT Supercross will go on. Season 8 is next, and we have no intention of backing down. Our goal is always to our racers, first, and we can’t wait to see what the future has in store for us. Congratulations to Sodapop Remix on winning his 2nd consecutive title, and to l Panny l and Gogetarulez for taking the last two spots on the podium! With his win, Sodapop solidifies his position as the best racer this squad has ever seen… But defending that title won’t be easy. 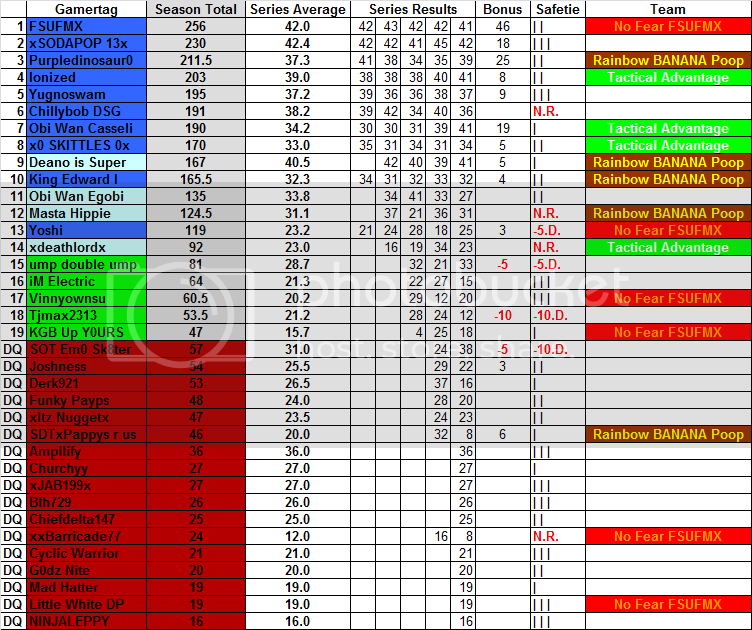 Another congratulations to Sodapop Remix and his team, Monster Energy Kawasaki, on becoming the best team in Season 7! We look forward to seeing all of you back out for Season 8. It’s sure to be on helluva ride. <iframe width="813" height="811" frameborder="0" scrolling="no" src="
" adds together your top 8 finishes and bonuses. " " takes the average of your top 8 finishes.
" totals the amount of times you did not qualify for the Main Event of a race.
" column totals the amount of times you were found guilty of wrecking someone.
" compares your position the first time you cross the finish line to your final position. If you crossed the finish 5th on the first lap and then finished in 1st, you would be given a +4.
" column tells you how many times you have gotten a holeshot, which is awarded to the first person to pull out of the first turn on the first lap. On newer tracks, this is indicated by an overhead pole. * Individual race statistics can be retrieved by downloading the whole Excel document. This can be done by clicking the Excel logo on the bottom right. <iframe width="814" height="487" frameborder="0" scrolling="no" src="
* Every member of the leading team gets 3 points added to their season total, second place team gets 2 points added, and third place gets 1 point added. * My Excel skills don't allow me to list Teams in order of points position, so you have to reference the rank on the left side of the table. Season 6 played host to HT Supercross' biggest season ever. Over 40 racers competed in 17 races, facing dangers from both track design and, especially, the competition brought forth by everyone around them. Most of those racers banded together, in hopes of increasing their odds of winning. Those same teams went to war with each other, but HT Supercross can only have one winner. Our season started out with more racer participation than we ever expected. The early trials of Season 6 forced 20+ racers to qualify for a 14-man Main Event. Odds of getting into the Main Event on one's first attempt were often lower than 50%. Anyone in the LCQ dealt with even harsher probabilities. Only the best of the best could make it into the Main, and only the elite could finish atop the podium. As the season progressed, we no longer saw a mass of racers, but contestants still racing [almost always in full Main Events] had only gotten better as time went on. Winning became even more of a challenge, and the definition of 'determination' was redefined. Season 5's winner, Jake Bobius, held the responsibility of defending his title against sure-fire contenders like xSODAPOP 13x, Casselfied, and 3-time HT Supercross season winner, Jeffh3962. However, it would be relative newcomers like xPA32x and PANCAKEMUFFIN that raised the proverbial crowds from their seats. With a profusion of speed, endurance, and mind blowing fortitude, all of these racers burned through rubber and metal to earn the title of Champion for themselves. Our season began with Jake Bobius and xPA32x trading blows for the 1st place spot atop the leaderboards. It wasn't until xSODAPOP 13x actively came into play that Jake and xPA32x were finally passed. Jake also mysteriously fell off of the radar, leaving some to speculate on if a repeat would have been possible despite Sodapop's ferocity and cunning on the racetrack. PANCAKEMUFFIN began his season relatively late, but immediately showed himself as a contender leading the Gentlemen's Club on a mission to dethrone the dominating Yoshimura Suzuki team. Missing a few key races, his dream of a podium finish fell short. Casselfied's performances vastly improved as the season went on, and surpassed Jeffh3962 for a top 5 spot late in the season. Due to his tyrannical command of a Mongoose over Supercross tracks, xSODAPOP 13x, leader of Yoshimura Suzuki, vaulted up to the 1st place spot mid-season, and would have to hold his spot up until the very end. At that end, his efforts would prove to be successful. xSODAPOP 13x, after a 2nd place finish in Season 3 and a suspension during Season 4, has finally attained the title of Champion. A title that becomes harder to earn with every race. His skill is testament to what a true competitor must acquire to become victorious. Now, he is charged with defending his title going into Season 7. New challenges await, and a new Supercross experience will unfold. Racers will acquire fame or infamy as HT Supercross is opened up before the masses. Sodapop heads into Season 7 as the champion. The man to beat and leader of the highest ranked team in HT Supercross. A huge congratulations to xSODAPOP 13x for winning the championship, and an enormous thank you to everyone that participated and made this season the greatest season we've ever had! We look forward to seeing everyone come out for the next season. HT Supercross is going to be doing some new things that have never been done before. It's going to be bigger. It's going to be better. This is HT Supercross, and we're going to let the entire Halo community know just who we are. <iframe width="813" height="937" frameborder="0" scrolling="no" src="
<iframe width="813" height="686" frameborder="0" scrolling="no" src="
*Every member of the leading team gets 3 points added to their season total. Jake Bobius now holds the crown. Season 5, hands down, delivered the most competitive racing to date. We started a new format after dumping the Series format we has used for Season 3. This season began with Jake Bobius and the Unkown kids consistently coming out on top. The top 5 was an ever changing element within our leaderboards, and nothing was certain up until the very end. Jeff and Purple both started their ascent around midway through the season. With Jake consistently placing in the podium, and Jeff's lack of first place finishes, Jake became the clear favorite to win. Rookies like UnkownGaming also proved to be a very real threat to the title. Podiums began to fill up with new names. Something that would eventually become commonplace throughout the season. Congratulations to Jake for finishing Season 5 in first place! Purple and I would like to thank all of you for making Season 5 our most competitive season ever! You all have made HT Supercross' success possible and have allowed us to become the longest running squad in HaloTracks history. Our summer seasons are up next, and we can't wait to have everyone back for more Moto-styled action with large breasts! * The Holeshot column tells you how many times you have gotten a holeshot, which is awarded to the first person to pull out of the first turn on the first lap. On newer tracks, this is indicated by an overhead pole. * "+/-" compares your position the first time you cross the finish line to your final position. If you crossed the finish 5th on the first lap and then finished in 1st, you would be given a +4. This topic is reserved for explosive Halo 4 HT Supercross action with large breasts. xSODAPOP 13x - Multiple accounts of cheating and attempting to wreck racers. Racer's squad membership has been revoked. xJAB199x - Multiple accounts of cheating, attempting to wreck racers and going backwards on track. Racer's squad membership has been revoked. Season 4, our first Motocross season, was discontinued due to changing events within HaloTracks. Season 3 is officially over, with what has easily been the most successful season to date. So many contentions erupted throughout the endeavor, that is wasn't clear on who would finish where. HT Supercross continues to have the best membership, the best members, and the highest average attendance of any other squad. It is more than true to say that this squad is the best, and you all make that possible. In the beginning we had not just Series races but also mini-events as well. I had stated that these would make a difference in the end. Soda Pop outgunned FSUFMX to take the highest Series total. However, it was because of the constant attendance at mini-tourneys that FSUFMX was able to pass up Soda Pop to achieve three total Season victories. So far, he remains the only person to ever win an HT Supercross season. However, with Soda Pop being an ever present force in both Series and Mini-Events, will FSUFMX be able to contain that title? Will Soda Pop, the lighting rookie be able to take up the mantel and be crowned the Season victor of Nationals? Only time will tell, and our clocks are ready to explode! It wasn't just the omnipotent forces of FSUFMX and Soda Pop this season though, as the battles for the top 5 were waged just as malevolently and brutally. Purple Dinosaur takes the coveted third place position, his highest yet! Our gracious Ionized had one major nemesis this Season, his own connection. He takes a very valiant and well earned 4th place. Finished off our top 5 is a contender that showed up midway through the Season, Yugnoswam. He felt the stress of long Series races, but managed to pull through to get a top 5 spot. This is not to say that everyone else did not earn something. Everyone this season had to trade paint at some time or another. From Chillybob DSG to EoE Oh SNAP (KGB Up Y0URS), I could only imagine how much they fought to get to the top. Sometimes, however, things don't work out as planned. I want to personally thank everyone who did not finish in the Top 5 for continuing to race and fight through sometimes benign Series conditions. Remember that you now have even more experience to carry over to the Nationals season. That is your most important aspect, and what gives you heart! Next, is a very, very important part. Which Team wins the season? Teams are a brand new thing to HT Supercross, and this season we saw conflicts and teamwork of which the likes we've never seen. Finally, winning a race could be achieved through the honor of having someone in your team ward off any aggressors. Finally, being in HT Supercross could give you a sense of more purpose that you would already have as one of our outstanding members! Get ready, here are the Team Standings. There, ladies and gentlemen stands the best team in HT Supercross. Team Rainbow BANANA Poop has pulled off consistent placement in Series time and time again. This gave them the perpetual edge to achieve the best team in HT Supercross. History is full of champions rising.. and falling. Teams are going to be hungry to bring down the victor, and the boys in BANANA Poop are going to have to forge a rainbow of steel to ensure their place up at the top of the Team mountain. Congratulations to everyone who placed this Season. It was a rough ride, and by placing you show that you can endure many hours of stress on your wrist. Supercross is a force to be reckoned with, and it's not over yet. HT Nationals will have a go next, and we will see what explosive results take place there. This... Is just the beginning. No movement except for the removal of Derk for not participating in enough tournaments. Thank you all for participating in HT Supercross this season, and thanks to all of you who participated in enough tournaments! Congratulations to KGB for the win, and also to Cassel and Deano for the podium positions! You will be contacted about the prizes shortly. Thank you all! This topic will be dedicated to posting all results to tournaments. KGB, you jump started one time and lost 5 points therefore taking you from first to second. Hopefully you'll learn from your mistakes. If you are confused as to why you lost a safety, then ask me. This was a highly competitive tournament. Strong packs led to variations in placement and position. KGB XD took control over the whole tournament, but suffered a 5 point deduction for a jump start. For those of you who are forgetting to come to the tournaments, please at least tell us 3 hours in advance that you won't be coming so that you won't loose a safety. Thanks. This tournament was a close one with a crazy scramble for early tourney control. KGB and Pappys where slowly creeping up in the points chase from bad results in the early races. Cassel had the mid tourney control, but struggled to hold off the speed of KGB in the late races. KGB would grab yet another victory over a stacked field. Cassel finished 3 points behind in the runner-up spot. Pappys was eagar to grab a higher position, but he was 2 points behind to grab 2nd. Pappys would have to settle for third. Chillybob finished a close 2-point gap for 4th. Edward struggled to keep it together, and salvaged a hard fought 5th position. Thanks to Cassel for writing this. Pretty bad tournament overall. We had some quit outs (50% of the beginning 8 racers left for one reason or another), we had some arguments, and we had some dumb decisions. This tournament is a perfect example of why I hate demo racing, because it makes everyone who's on a demo team feel like they have the right to turn around MIDRACE and wreck others. Dumb, dumb decisions. By the way, if I have to deal with this again Deano, then you are being permanently removed from the squad. I have no idea how to deal with you Pappys because you're the leader of the blam!ing squad! You either need to stop what you are doing, or just remove yourself from your position because you're not helping. This was a competitive tourney up to the point where everyone simply dropped out. Not to good for them, as they lose a safety and get low placement in a tournament. For those that remained, races still remained competitive. Pappys, eager to win, put on a fiery effort but couldn't match the consistency of KGB. Another quite swell tournament. Derk and Deano do lose a safety. KGB was again dominating, with Cassel catching up to him... If only it weren't for that menacing King Edward I for nabbing that second place! Would have been a better tournament if it weren't for Cassel's whining and screaming. However, the debut of my new MX track, Diamondback, was successful. I got some great compliments and am looking forward to racing it more often. Cassel, even though he should have gotten 4th in reality, whined his way up to a 3rd place tie with Edward due to some untimely "lag outs" and "black screens". This tournament started out sketchy, with racers racing like..savages. However, things cooled down once racer respect kicked in. Deano gets his highest finishing spot of the season, and this will greatly improve his percentage. Josh also had a couple podiums, which gave him his spot on the...podium. Once again, KGB proved to be the most consistent, and fastest racer out there, with only 2 races where he didn't podium but still managing to get the points to grab that first. The experimental tournament format proved to be fair, and competitive. It really demonstrated the racers' skill on each track. The veto system also implemented some great tournament results. All in all, a good tournament. Overall, a sketchy tournament to say the least. Competition was alive, and tensions were even higher. Purple and KGB ended up with an abnormal tie for 1st place. Put simply, Purple stepped it up this tournament! Pappys' hangs his head high with another podium finish. Remember kiddies, consistency is the name of the game! I would say that this was overall a good tournament. It would have been even better if maybe a few specific people didn't overreact to extremely minor things. Ordinary, you were doing FINE. I let Deano take over your points, and look at how good he did. Maybe if you weren't on your period, you would have done just as well as him. TJ and Epic are just bad sports and couldn't finish strong. Since KevinandBryan stuck through the whole tournament, he got a 50% instead of a last place, unlike the quitters who all got 0%. I would say the laggiest tournament in history. For the newer guys in the tournament, not every tournament is like this. We have our good and bad days. Aside from some connection upsets and some restarts, it was a swell tournament. I've never heard so much buzz about the packs, meaning all of the guys in the middle of the results were in constant battles for their spots. With some very, very close results, I hope people will come back for more tournaments in the future! Look out for more variety in our tournament schedule, as well as some National integration! P.S. Purple was only 5 minutes late, sorry purps! I liked the format we did for this one. It really pressed on how much you've practiced on tracks, rather than blind skill based off of short races. Requiem's whoops were the real taker for this one. A reminder for those who constantly b**ch about tracks sucking: If you don't take the time to practice on the tracks, then you do not get the right to blame the track for your lack of skill on it. I (KGB) hosted this tourney and came out with another win. Deano and Emo, with their gamertags rhyming, had a decent finish and were very close to a tie. PRACTICE THE TRACKS! SX Tips coming back soon, watch those as well. This was a fun tournament. Very, very little complaining and the most competitive racing I've been in since midway through this season. Purple and Deano with a phenomenally close finish. You had no idea which one of them were going to grab that second place. Just remember to practice those track guys if you want to get good! Fun tournament, Season Finale is next! Well guys, Season 2 is over! This was the first AMA formatted race, and it ran smoothly (with the exception of some lag here and there, but nothing too major). This lasted as long as a regular race, so it's a good thing we ran both Heats at the same time! The Heat's were full of suspense, as no one wanted to be sent to the LCQ. However, the Main Event was the real show. Racers lined up, revved up, and hit the throttle on that 3rd destination. Cassel kept it together for the entire race, but 20 laps on Requiem is definitely a test for everyone. Cassel comes up top, and KGB managed through a tough race to pull off a second. I'd like to make an example though. Payps had practiced the track over and over again, and pulled off a 3rd place. If you don't want to flip constantly, and don't want to be out of the top 3, then you need to practice these tracks (of course, none of these tracks are perfect, but practicing lowers your chances of flipping). All in all, this has been a PHENOMENAL season. The Leaderboards were tense, and we had great participation from everyone. You all make this squad possible and keep it alive. On behalf of Pappys and Purple, I thank you all for staying and competing with us. Season 3 is a few weeks away, and a full video is coming shortly providing you all with the AMA television experience! *NEW* Final standings. Congratulations to KGB! *Those in red did not make the 4 tournament deadline.